Liam Neeson stars in Taken 4 what Taken 2 should’ve been. As Jimmy Conlon, Neeson must defend his estranged son, Mike (Joel Kinnaman, Robocop, The Killing), from his aging best friend and boss, Shawn Maguire (Ed Harris). In the space of one New York evening, Jimmy must shake off his shame-induced alcoholic stupor, battle his old mates, and save the grandchildren he’s never met. It’s electric, thanks to the direction of Jaume Collet-Serra (Unknown, Non-Stop), and the gravelly-voiced sixty-three-year-old action star. When Maguire’s son (Boyd Holbrook, Gone Girl) bites off more crime than he can chew, he kills the Albanians who come to collect their money. But Mike sees the crime and becomes a threat as a witness. When Mike’s declining hit man goes to smooth things over, he ends up killing Maguire’s son, and retribution is in order. Nothing but bullets will stop this war of wounded pride and dying hope. 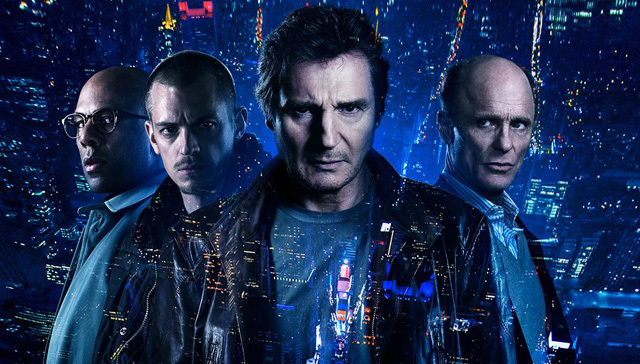 The film was my second-favorite Neeson film, after the Lawrence Block-inspired A Walk Among Tombstones (also starring Holbrook), to come out in the last year. The way it was shot, New York City came alive as a character, setting a backdrop for the likes of peripheral characters to play their parts. Common, Vincent D’Onofrio, Holbrook, and Holt McCallany don’t have to do anything particularly awesome on either side of the cops and robbers battle, but the niches they carve out fit perfectly. This is Neeson, with a side of Kinnaman, against the world, with New York as the backdrop – specifically a Rangers game. This entry was posted in Current Events, Movie Reviews and tagged A Walk Among Tombstones, Boyd Holbrook, Ed Harris, Joel Kinnaman, liam neeson, Run All Night. Bookmark the permalink.